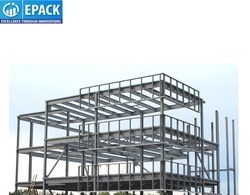 We are Manufacturers & Exporters of high-quality Prefabricated Steel Building, Steel Building & Prefabricated Industrial Steel Buildings, Prefabricated Industrial Steel sheds, Prefabricated Industrial Buildings, Prefabricated Commercial steel buildings from India. Our Prefabricated Steel Building are customized in nature & maintining high industry standards. We are offering fines range of Prefabricated steel buildings that are Pre-engineered steel buildings (PEB) are steel structures built over a structural concept of primary members, secondary members, roof and wall sheeting connected to each other and various other building components. These Prefabricated steel buildings can be provided with different structural and non-structural additions such as skylights, wall lights, turbo vents, ridge ventilators, louvres, roof monitors, doors & windows, trusses, mezzanine floors, fascias, canopies, crane systems, insulation based on the customer’s requirements. We are offering a high-quality range of Light Gauge Steel Frame & Prefab Steel Buildings. 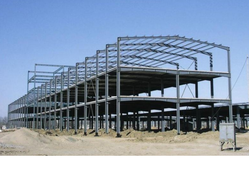 We manufacture Prefabricated Steel Building, Steel Building & Prefabricated Industrial Steel Buildings, Prefabricated Industrial Steel sheds, Prefabricated Industrial Buildings, Prefabricated Commercial steel buildings. The offered frame is fabricated under the proper observation of our knowledgeable professionals by making use of premium quality steel and modern technology as per standards laid down by the industry. Easy to install and dismantle, the provided frame can be utilized as a structure for hotels, mess, health care centers, education centers, etc. Available in diverse designs, sizes, and other specifications, our experts offer this Light Gauge Steel Frame at the most reasonable price range.